Let me say this LOUD AND CLEAR. Downloading ebooks from pirating sites is stealing. They are not a lending library, you get to keep the books forever if you choose. If you want to check out my books then ask your local library to get them for their ebook program, its available to them. Library's pay the authors for their books. They are legit, pirating sites are not. If you think I make a lot of ...money doing this I do not. Do I want people to read my books yes but pirating doesn't help my book it hurts it. Do not buy into the hype that this is okay, or LEGAL it is NOT. This is theft plain and simple. Pirate sites do not own my books, I do and I have NOT given them the right to use my books in any way... If you can't afford my book ask me if I have free copies to give you. DO NOT STEAL THEM. Thank you to all those who have spent the 3.99 my most expensive book costs. I am thrilled to announce that my 2nd book in the Wiccan Haus series released today !!!!! So in honor of the Release I will give away one copy of Siren's Serenade or Shifting Hearts to those who help spread the word on facebook about the release. 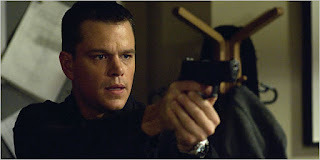 Jason Bourne helped make me the writer I am today. I know it’s probably an odd statement to make, but hear me out. From my 1st and only Disney movie as a child, The Rescuers, to my favorite TV show as a middle schooler, The A-Team, I was always intrigued by the good guys winning and the villains getting what they deserved. I grew up on suspense, and, unlike many romance writers, I didn’t start reading romance until I was in college. The stories I read then were good, but I often felt like they were missing something. Welcome to my stop on the blog hop... and honestly you deserve a break if you made it all the way here. As I think I am the last stop of the tour. And to you who have hopped a lot to get here. I say thank you too. And here is my favorite scene from Top gun as a treat... Oh girls you sooo know the one. Now for my Coast Gaurd man. Coming July 13th to Musa Publishing. As a writer I am thrilled to have the freedoms I do here in the USA. Are we perfect NO but am I proud of the battles the generations before me have fought yes. I can write what I want, I can read what I want, and I can vote to make things change. To keep this simple you can enter to win the book of your choice in my back list. Check the list on this blog. Just leave me a comment telling me which book you want and follow me here.